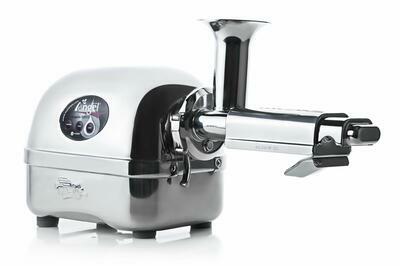 Angel juicers are often considered the gold standard of home juicers. Made completely from stainless steel, Angels use twin gears rotating in opposite directions to get the highest yield and clearest juice. While they only produce three models, it can sometimes be confusing to differentiate between them as some retailers rename them or bundle them with accessories to create "new" models. Regardless of the name given on any website, there are only three home models produced by the Angel factory. Let's look at the three models and examine the differences. The 5500 is the standard model of Angel juicer, and the one on which the others are based. All Angel juicers are very similar. They all feature the same motor, same auger design, same touch controls, and same stainless steel motor assembly. The performance and yield is identical for all three Angel models. The 5500 is made from SU304 food-grade stainless steel. This grade of stainless steel is corrosion resistant and will stay looking new as long as it is cleaned properly after each juicing. Like all Angel models, the 5500 uses two counter-rotating gears which break down fruits and vegetables to their smallest components, allowing for the highest yield of any home juicer. You can learn more about the Angel 5500 here. The Angel 7500 is identical to the 5500, except for one difference. The 7500 has an auto-reverse system, something the 5500 lacks. If you overload any Angel - either by feeding it too quickly or by putting in too large pieces of soft or stringy produce (berries, pineapples, celert, etc.) - there is a safety mechanism which will stop the motor when it jams. This is to prevent overloading or damaging the motor. When this happens, the motor needs to be reversed for a few seconds to move the jammed ingredients backwards and free the jam. In the 5500, this is done manually by holding down the reverse button for a couple of seconds, releasing it allowing the gears to stop, and then pressing the forward button again. The 7500 automates this process. In the event of a jam, the 7500 stops the motor, reverses it for 2 seconds, then proceeds in the forward direction. This is simply a convenience feature that allows you to not have to touch the controls during juicing. See more about the Angel 7500 in our eshop here. The Angel 8500 keeps the auto-reverse system found in the 7500. The difference in the 8500 is that the juicing parts - the augers, housing, and juicing screens - are made from SU316 stainless steel. This is also known as surgical stainless steel, as it has a 2% molybdenum content to make it even more corrosion resistant. This steel is resistant to stronger chemicals such as sea salts or chlorides, and tends to be a little easier to keep looking new. 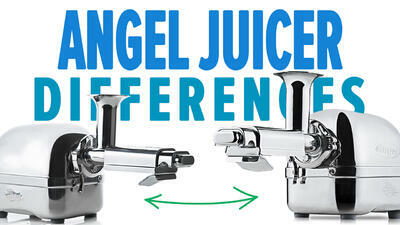 However, if cleaned promptly after juicing, all Angel models will stay looking new. The 8500 is for those customers who want the highest grade of stainless steel, and it is priced accordingly. You can see all the details about the Angel 8500 here. If you'd like to see more, we filmed a video clearly demonstrating these differences. You can watch it on our YouTube channel here.